Born in the UK to American parents, O’Shaughnessy has lived, been educated, explored and worked in more than 90 countries. 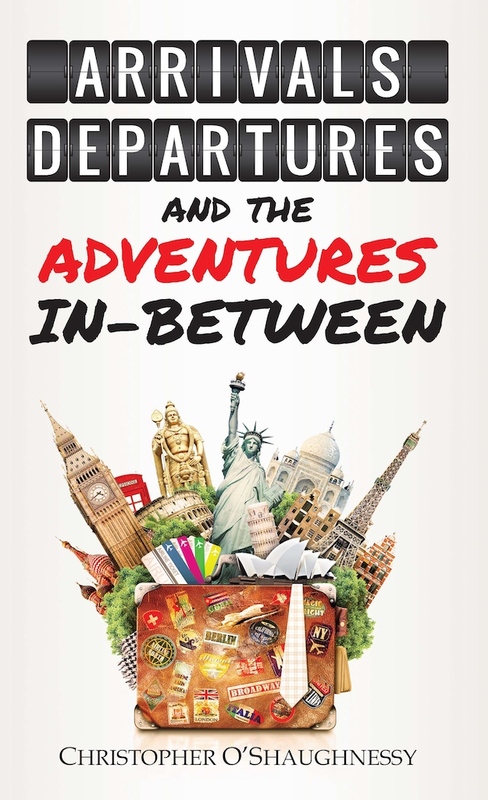 His experiences are incorporated into Arrivals, Departures and the Adventures In-Between providing humorous personal anecdotes to explain the issues frequently experienced by expat kids relocating to new countries as dictated by the jobs of one or both parents. Specifically the book looks at what it is to be a Third Culture Kid (TCK), Cross Culture Kid (CCK) and Invisible Alien. Definitions are provided with reference to earlier work by Ruth van Reken, Dr Ruth Hill Useem and David C. Pollock. In short, all three labels refer to children who have grown up outside their parents own culture in temporarily adopted countries – and as a result have an ambiguous national or cultural self-identity. Chapter One opens with a tale of self identity resilience in the face of opposing pressure from others and the identity they have of you. In this specific childhood example, O’Shaughnessy believed he was a robot – a fact confirmed by static electricity in his bed-sheets. When confronted with the fact that he was not a robot – rather ‘just normal, nothing special’ (p5) he felt a sense of disappointment akin to the response many expat children feel on registering that their foreign-ness in a new school environment does not make them special with their peers. In the following seven chapters, O’Shaughnessy covers the implications of being TCK and CCK on personality development (adaptability, confidence), social relationships (guardedness, fitting in, conflict management), future directions (being rootless and restless), feelings of grief and loss, and the benefits of having a wider understanding of cultures, languages and global communities. Each chapter ends with a list of the points covered and references included in the text. The reader can also access additional information by scanning quick response barcodes found throughout the book with their smart phones. As a verified TCK, adult global citizen, and travel adventure addict – Chris O’Shaughnessy has the prerequisite credentials to write about the experience of growing up as an expat child. His personal stories are hilarious examples of the educational information he is presenting. Arrivals, Departures and the Adventures In-Between is a highly recommended read for anyone who has taken up the exciting challenge of becoming a global citizen with kids in tow. Further, for adults who were raised globally and now hesitate when asked questions like ‘where are you from?’ or ‘where do you consider home?’ – this book will not give you the answers, but it will help explain your hesitation.